A gift is not complete until it gets packaged and wrapped in a festive way. It’s the wrapping that gives the first impression and can make any gift more special. To inspire your creativity, I’ve put together a collection of creative gift wrapping ideas. These ideas are sure to make your gifts even more appealing. Game letter tiles are perfect for spelling out names for gift tags. 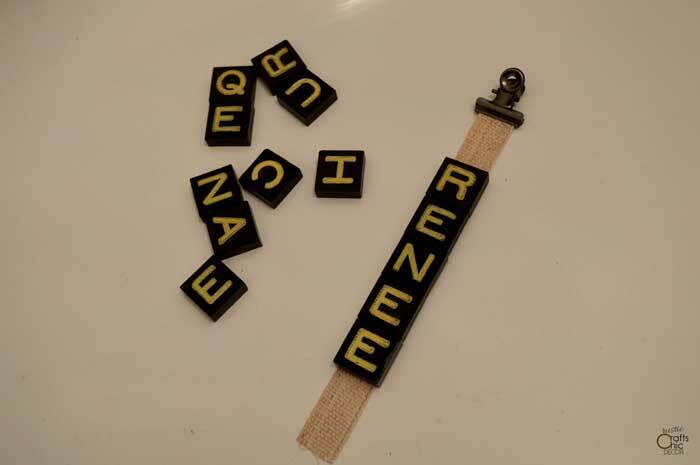 Whether you use Scrabble tiles or other game letter tiles, like these, they all work for making fun tags. I simply glued the tiles onto a small strip of ribbon and then attached it to a mini clip. This tag works great for clipping to the top of a gift bag. 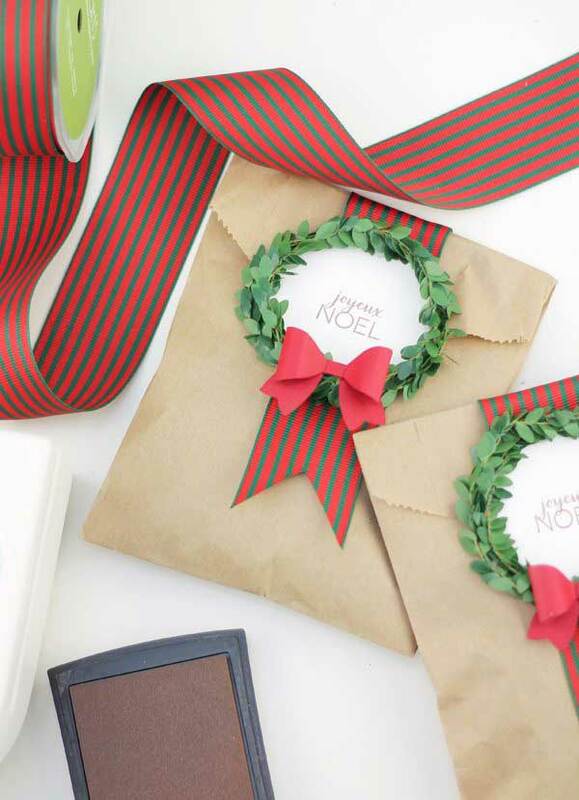 These pretty wreath labels make an ordinary paper bag look festive and fabulous. I have used the mini boxwood garland before and found it to be super easy to work with. It’s a wired garland so it’s easy to form into shapes. You can also use fun papers for some creative gift wrapping ideas. 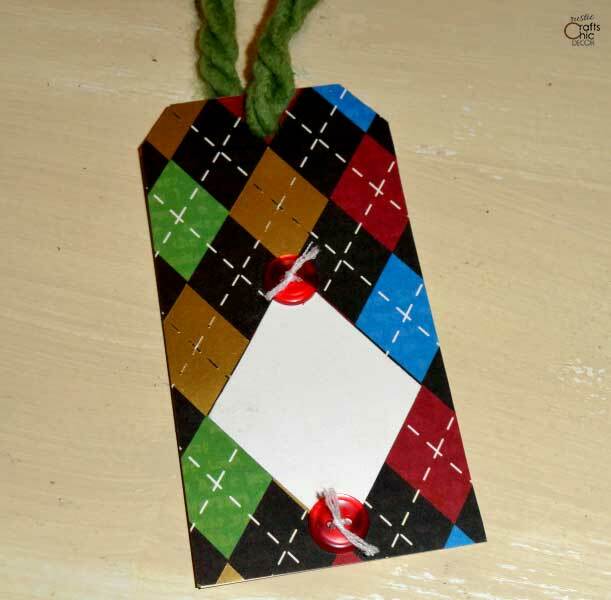 Plain manila tags can be made more special with decorative papers and little embellishments like buttons. If you want to personalize gift tags in a fun way, use photos for making the tags. 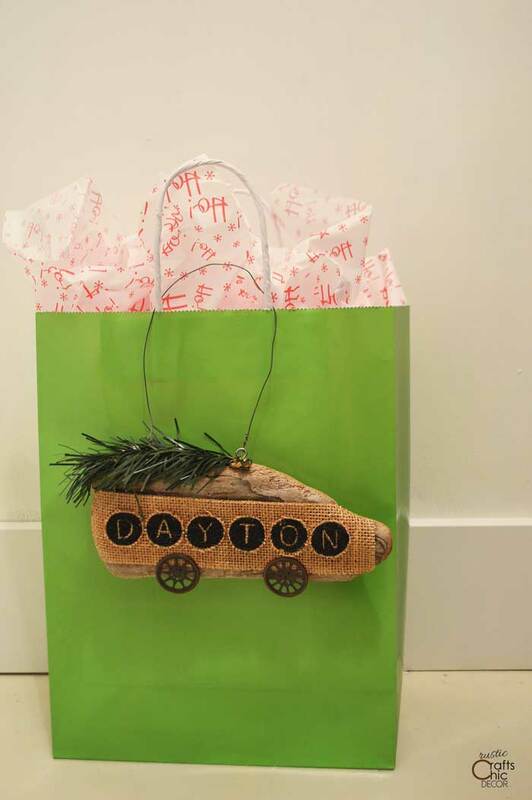 Use driftwood as a base to make fun gift tags that can be used later for home decor. Decorate driftwood with burlap, paint, paper or wood burning to make a unique tag. If your piece of driftwood has a shape that looks like a common item, emphasize the look with your decorating. I thought this piece looked like a car so I went with that theme. Since this was a Christmas gift, I added the look of a tree on the top. A package wrapped in Kraft paper is made beautiful with the topper. 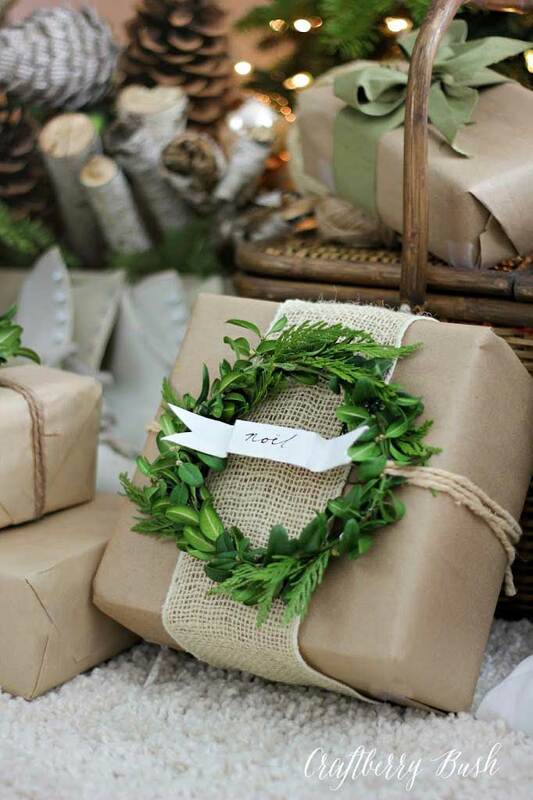 Using burlap, twine, and a wreath adds a ton of festive interest to the package. Talk about creative gift packaging ideas! This package is full of rustic goodness. 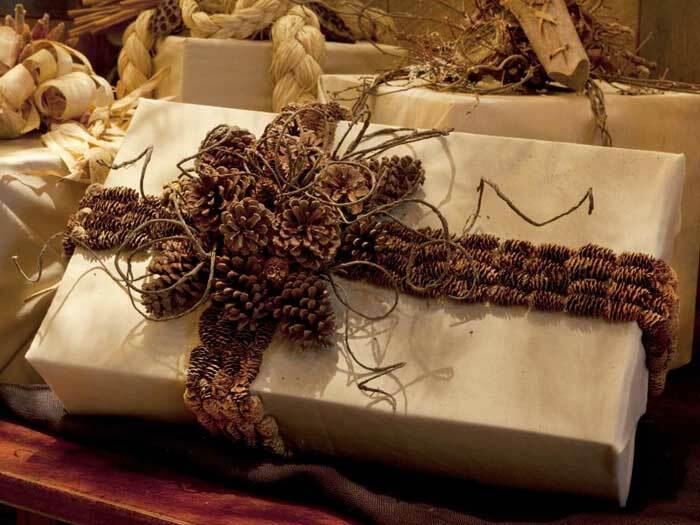 Using pine cones as the ribbon for the package is such a fantastic idea. Although it may be time consuming, the wow factor just might be worth it! A felt gift bag is almost like getting a second gift. Since the bag can be used over again for storage, it serves two purposes. 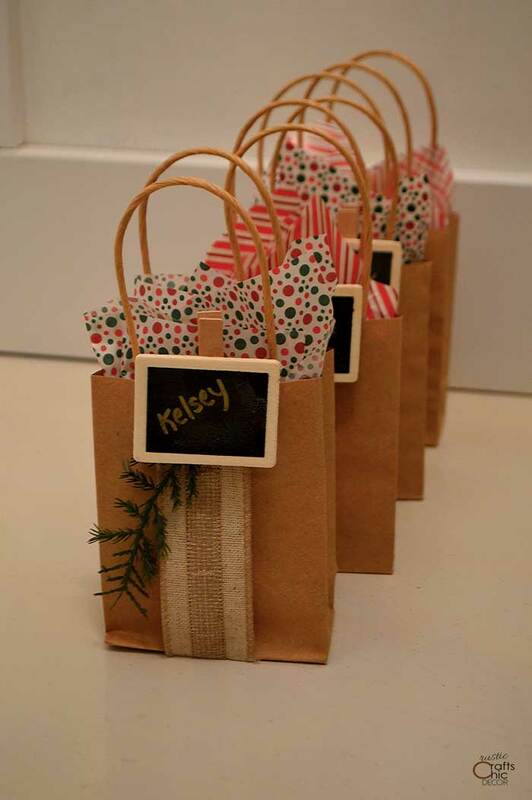 Transform an ordinary Kraft gift bag into something special and festive by adding embellishments. 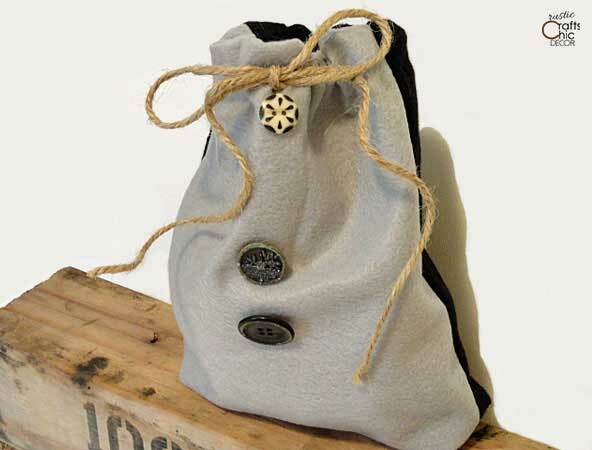 For these bags, I just added ribbon and pine sprigs to give them more interest. 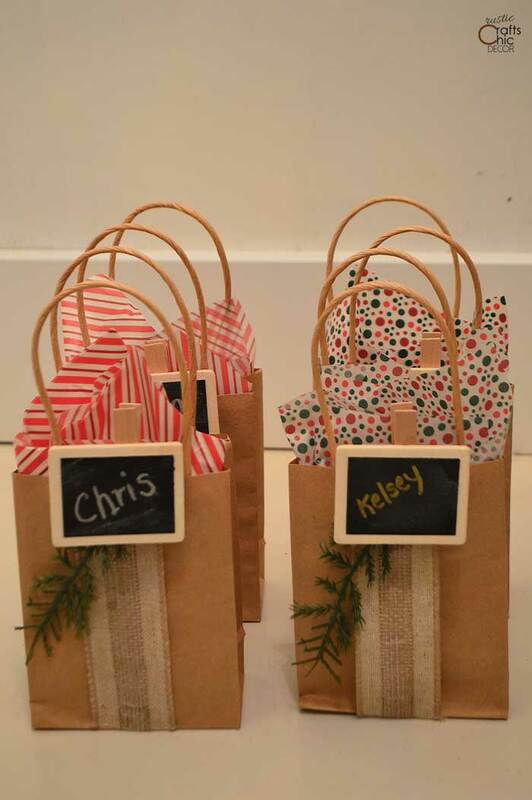 I glued the ribbon onto the bags but just clipped the pine sprigs with the mini chalkboard clips. Mini chalkboards are fun to use as gift tags. To contrast the neutral look of the bags, I used fun patterned tissue paper to top off the bags. I couldn’t decide between chalk and paint markers so I did some of each. For more creative gift wrapping ideas, check out these 15 creative and chic Christmas wrapping ideas.